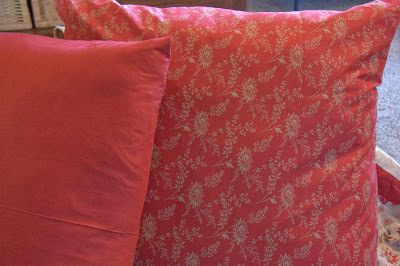 A few days ago I shared my pillowcases made with Organic Cotton Percale fabric from OrganicCottonPlus.com. 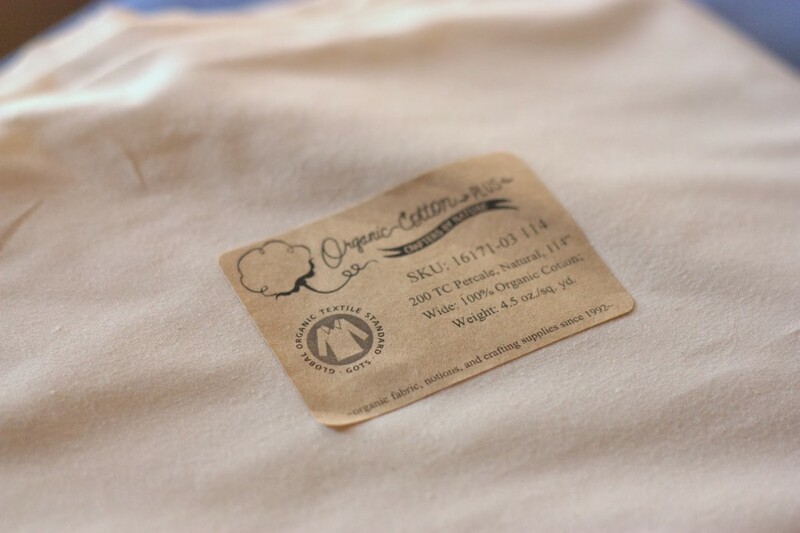 My post was getting a bit lengthy, so I decided to come back later with a bit more information on organic fabrics. The nice people at Organic Cotton Plus asked me if they could send me a few yards of fabric, in exchange for a review of their product. I’ve never used organic fabric before and I’ve never purchased fabric online, so this was a totally new experience for me. I made a few pillowcases out of the fabric and have some fabric to spare. 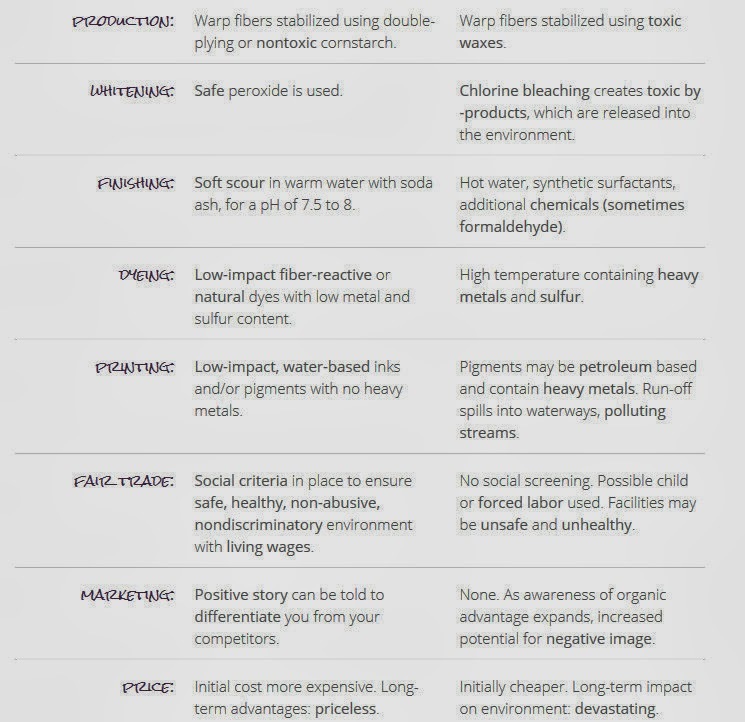 These were a few of the links that were sent to me about “why” we should consider organic fabric. 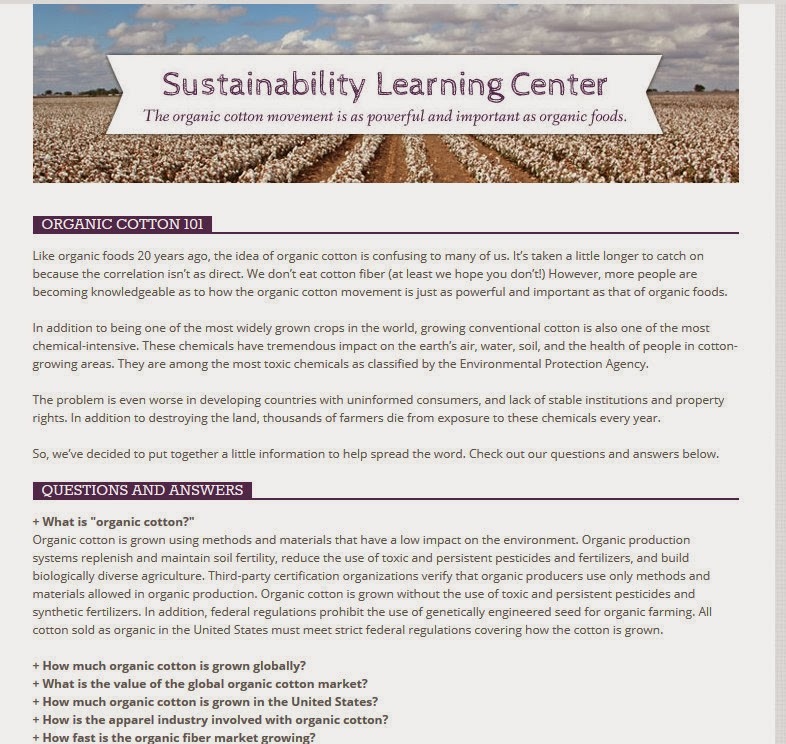 The OrganicCottonPlus.com website has some great information too. The following three images are from their website. Basically, my take away from this is the same as my thought on organic food. I buy organic whenever I can. (My farmer/cousins are rolling their eyes at me right now.) It’s better for the workers, the environment, and my family. I can’t always afford it, but I do the best I can. When I was purchasing fabric for pillowcases, I’m glad I went organic. Will I purchase organic all of the time? Probably not, but I would certainly purchase organic as often as I could. About a month ago I received an email from the nice people from Organic Cotton Plus. They asked if I would be interested in doing a review of their fabric. Now, you know that I really love to sew, but I wasn’t sure I wanted to use my blog as a place to simply review products. I love telling my friends/readers about products I love, but I wasn’t so sure about sponsored blog posts. I’ve done a few, here and there, but I want to be choosy about the companies I align with. Right about the time I was “sitting” on that email and just thinking about whether I was interested, I started planning my pillowcase sewing projects. At the same time, I was watching Dr. Oz and the guests were talking about all of the horrible toxins that are in our furniture, bedding, blankets, etc. 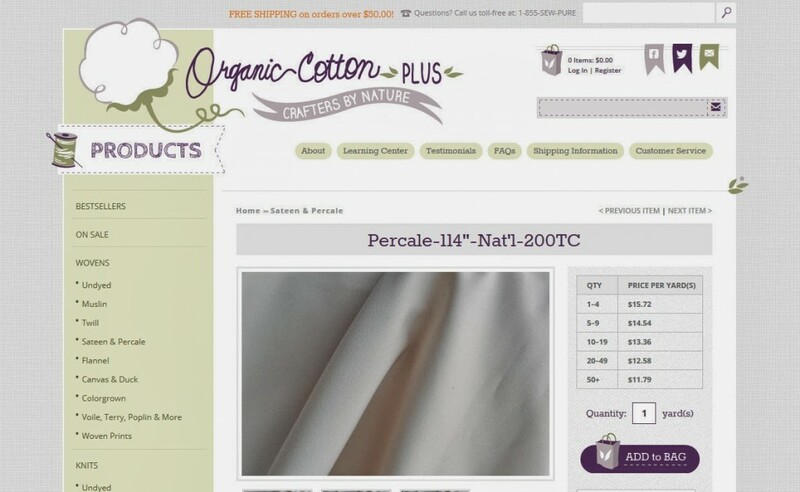 As I was watching, I was thinking to myself, “It’s too bad all sheets aren’t made from organic fabrics.” My mind wandered away from Dr. Oz, and I grabbed my iPad to check out that Organic Cotton Plus website. I emailed the company and told them that I would, indeed, be interested in doing a review and asked for suggestions on pillowcase fabrics. A nice 200 thread count percale was suggested, and a few clicks later, my order was being processed. They sent me a few yards, from a percale that is sold in an extra wide width. 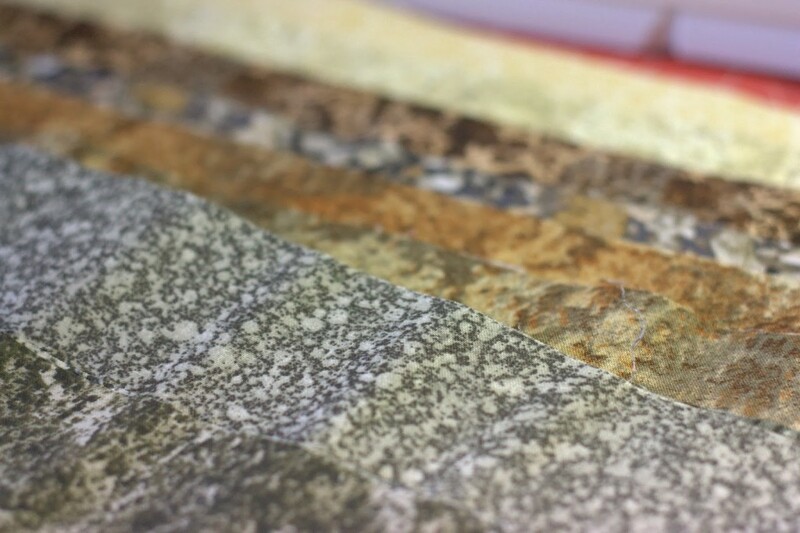 More fabric for me to play with! The fabric that arrived looked slightly darker than I thought it looked in the online photo, but it was still a perfect neutral. I could have just been their lighting vs. my lighting. I believe the color I chose was called Natural and I’d say it’s exactly that. If you sew with Warm and Natural batting, the color was quite close to that. It was a very smooth, slightly stiff fabric. It was exactly what I would expect from a 200 thread count percale. 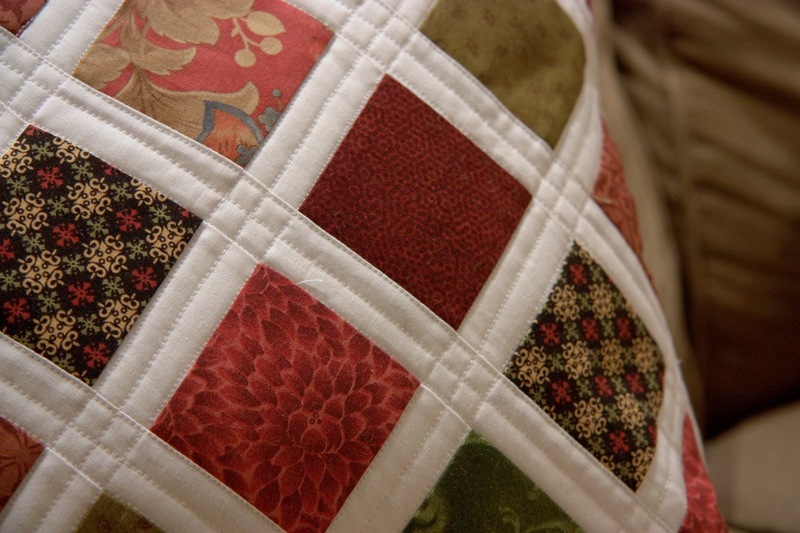 Do you know how you can feel the difference between quilting fabric and sheets? Well, that’s kind of what I’m trying to describe. New sheets just feel kind of stiff, but in a “my grandma probably would have ironed these” type way. My hubby (bless his heart) bought me a mini-jellyroll for Christmas. He was looking for something to put in my stocking, so he went into Jo-Ann’s and found a jellyroll he thought I’d like. He’s a keeper. 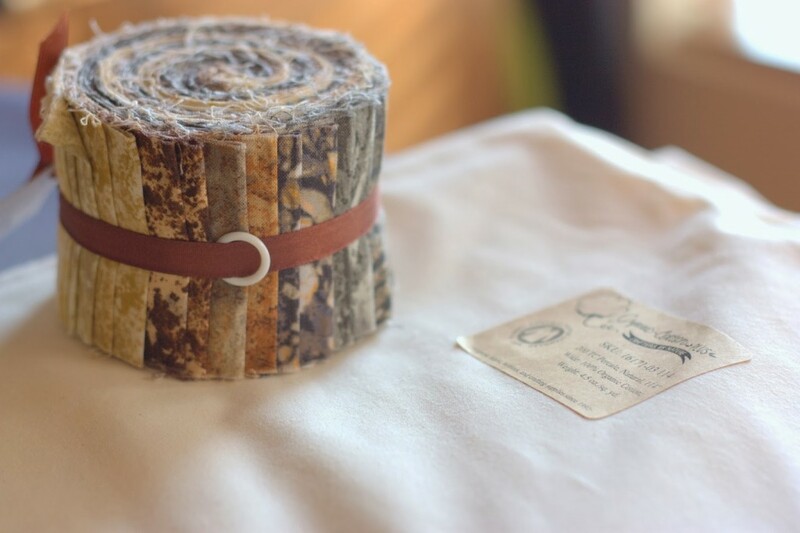 After setting the jellyroll on top of my organic Natural fabric, I knew it was a good match. 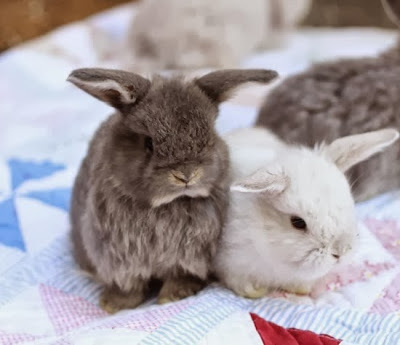 Now, you may be wondering why I was so quick to add non-organic fabric to my organic pillowcases. Knowing that I would just be using the jellyroll on the edge, I figured it would be ok. The main part that you put your head on would be organic. Also, I kind of wanted to sew with this fabric before jumping in and buying anything from the Organic Cotton Plus website. My fear was that I’d notice a bunch of imperfections from my organic fabric. I really had no idea what to expect. This is the first time I’ve ordered fabric online before. By the way, there were no imperfections in the fabric. It was actually quite impressive and I really enjoyed sewing with it. 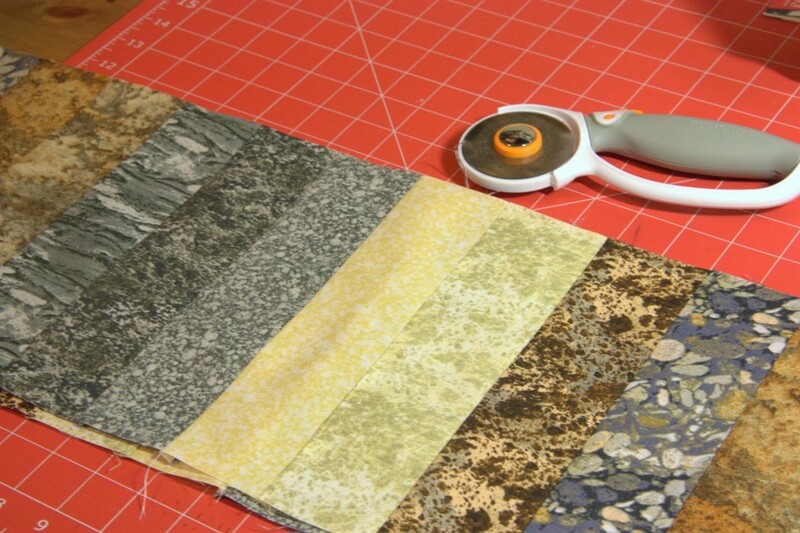 When I opened the jellyroll, I had to decide which order to sew the strips into. I was making this pillowcase for my son’s room, which is gray, tan, khaki, and heavy on the blah-ish colors. The jellyroll fabrics were really perfect for his room. They were boyish and just the right tones. I sewed the fabric strips together with a quarter inch seam. Then I pressed the strips toward the darkest layer. Next, I cut 9 inch strips across the strips I had just sewn together. This whole strip needs to be 9×44-ish, when cut. 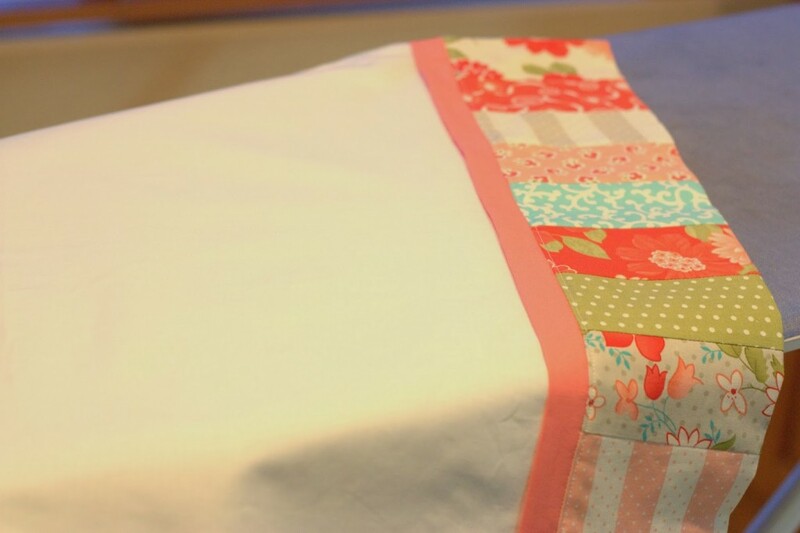 The main fabric for the pillowcase needs to be 27.5″x44″. Lots of times, when you buy fabric, it comes in 44″ widths. This fabric was extra wide, so I had to cut it down a bit. I’ve learned that when you’re working with lots of fabric, the “snip and rip” method works very well. I straightened up the edge, measured down 27.5 inches, made a little snip in the fabric, and then ripped it all the way down. The fabric will rip right on the grain. It makes it so much easier to work with and you don’t have to cut through all of the bulk. 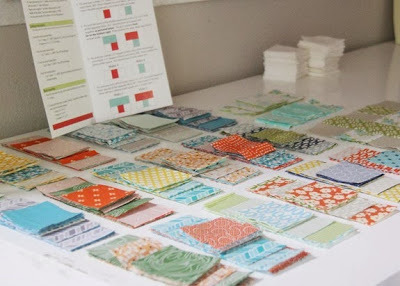 I use this same method when working with vintage sheets. The next few steps will kind of make your head spin, if you’ve never done this before. 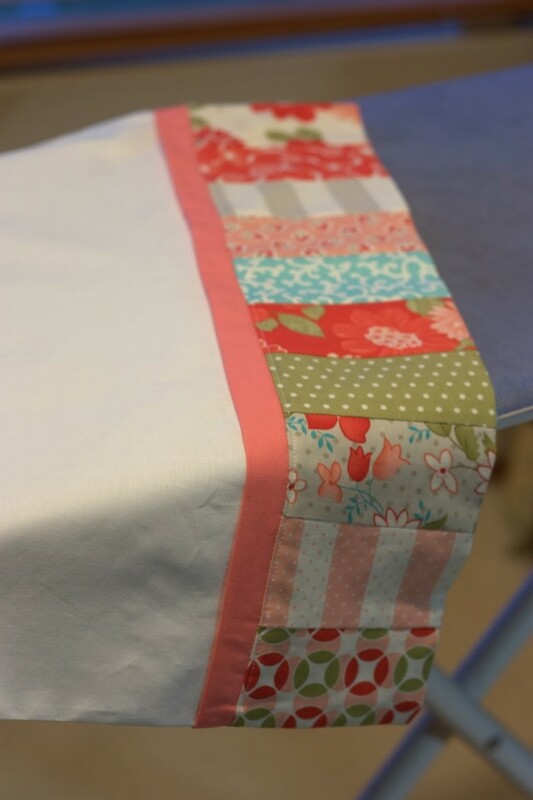 Lay the jellyroll strip so that it’s right side up. Lay the accent piece on top of that, and then the pillowcase fabric on top of that. The picture below show this step in process. See the three layers? I just haven’t lined them all up yet in this photo. This one shows them all lined up. Don’t worry if your edges don’t match up. You’ll trim those off later. At this time, I pinned those pieces together, just because I didn’t have much table space to work on. You don’t actually need to pin here, because you’ll just be taking these pins out after you roll it. It’s your choice. Then you start rolling the pillowcase fabric. Stop rolling a few inches from the top. Don’t roll the jellyroll fabric up yet. That step comes next. 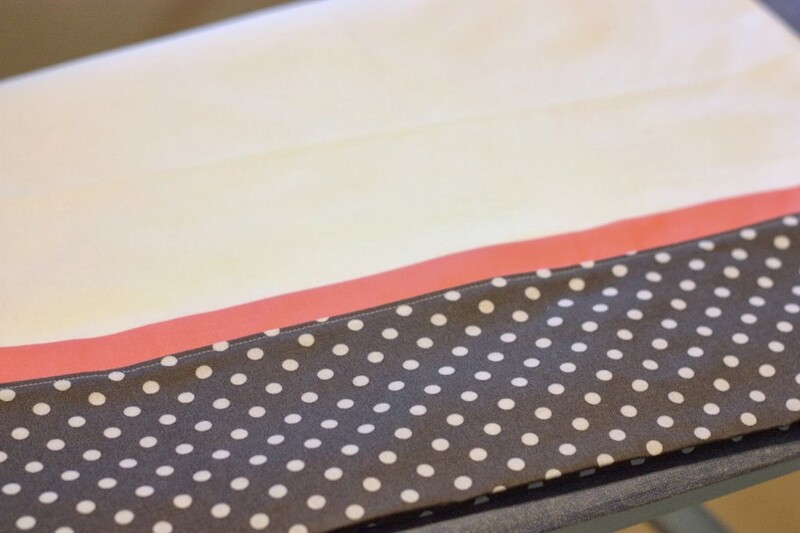 Once you get the pillowcase rolled up, you fold the jellyroll fabric over the top of the little roll. Then pin it. The goal here is to sew the layers together without sewing that roll into it. One layer is sewn in, but not the whole roll. See how it looks when it’s all sewn up. 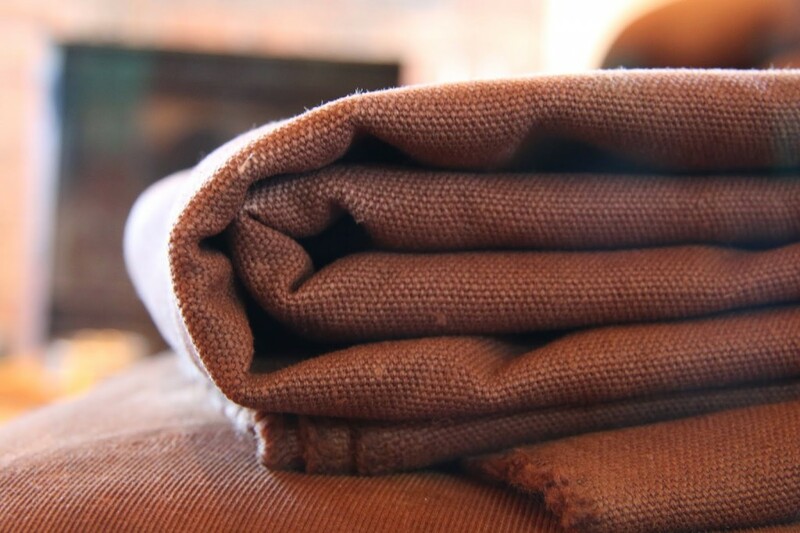 This is why they call it a burrito pillowcase, because it’s wrapped up like a little burrito. Then you need to turn this little burrito right side out. See how it looks now? 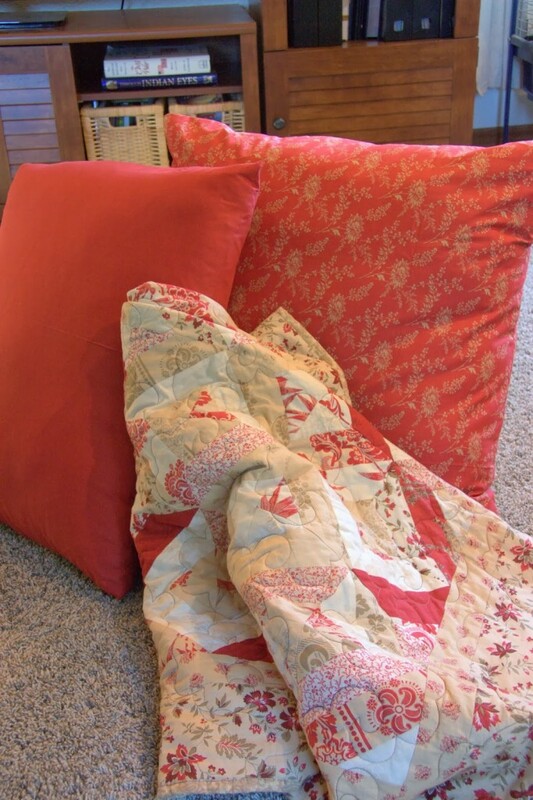 You have the jellyroll fabric, the accent fabric, and the body of the pillowcase. All of the seams are hidden inside and it looks neat and tidy. At this stage, I started thinking about all of the ironing I would need to do each time I washed the pillowcase. I decided to put a little stay stitching along the edge. I did it about an eighth of an inch away from the original seam. Here’s another tricky part. It’s time for the french seam. You now have three open edges of the pillowcase. One of the edges will stay open because you are putting the pillow in that way. So, for the french seam, you sew wrong sides together. It’s opposite of how you do most sewing. The pretty sides are out. Then, you will flip it wrong side out and sew up that same edge again. The first time I use a quarter inch seam and for the second run down, I use an almost-half-inch seam for this. This totally encloses the raw edge and you will never have little threads coming out. I had to watch a few YouTube videos on French Seams before this step made sense. 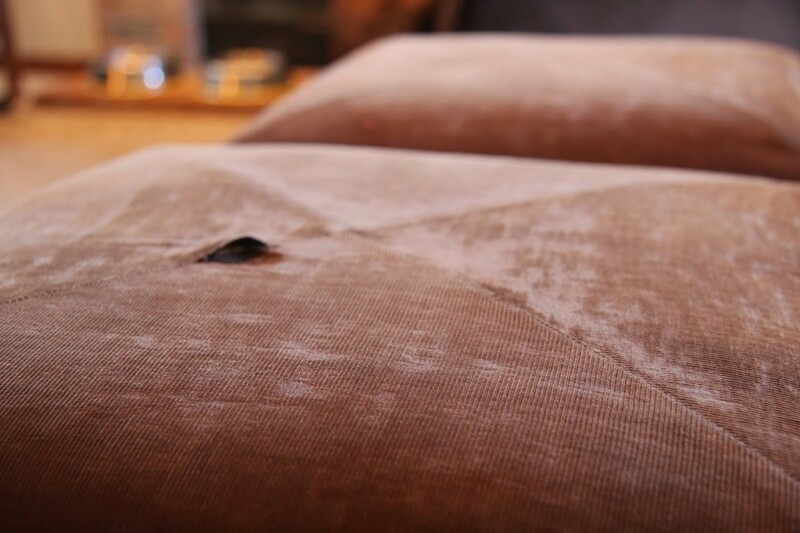 You need to do French Seams on the open side and the bottom. Then, you’re done! One last press and it’s all ready to go into my son’s rooms. I made two of these pillowcases because he has a bigger bed now. In case you missed them, here are the girly pillowcases I made last week. They are a lot more “sugar and spice” and a lot less “Duck Dynasty” but they both fit my kids’ room styles. 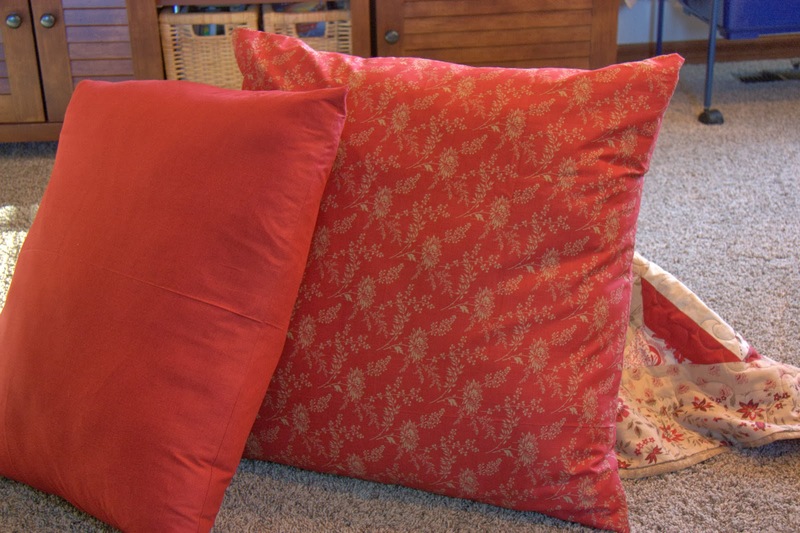 The girly pillowcases were not made with the organic fabric from Organic Cotton Plus. I just thought I’d throw those in to show you a few examples of cute pillowcases. 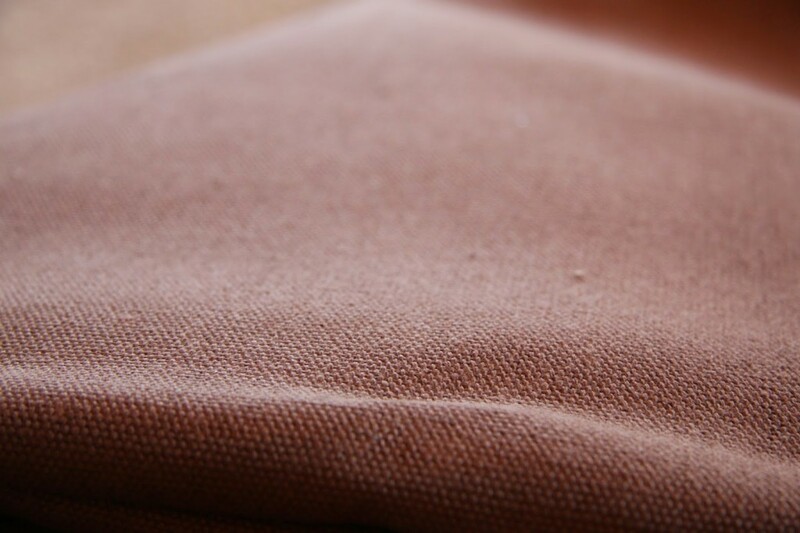 Tomorrow’s post will be about why we should bother sewing with organic fabric. 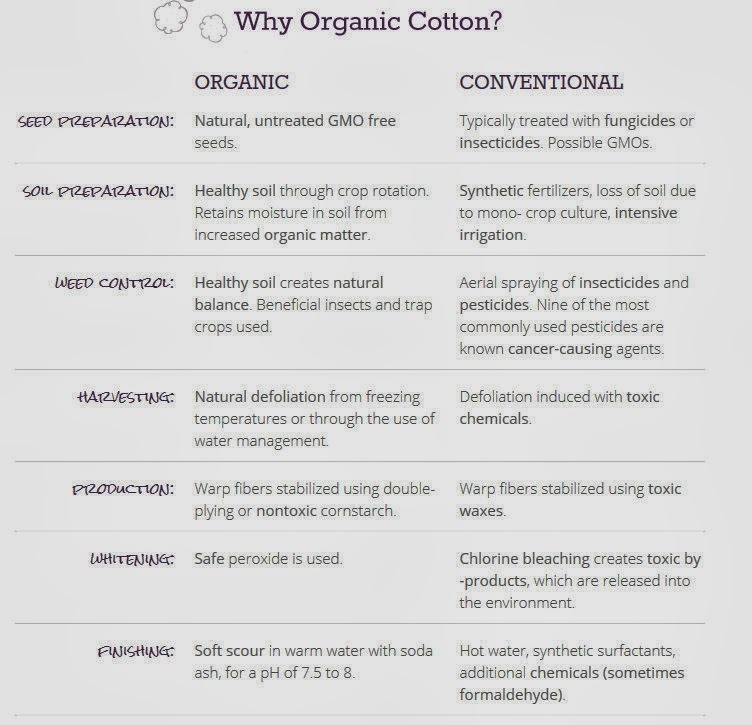 The nice people at Organic Cotton Plus shared a few links with me and I’ve learned some new things! When I think about learning to sew, I don’t actually remember learning. I remember “helping” my mom from a very early age. I also remember making a few things on my own when I was about 7 or 8. It was one of those things that my mom was always doing and I was always watching. It’s kind of like cooking. My mom was always cooking and baking, and I was helping, watching, and learning. So, if you asked who taught me to sew, I wouldn’t tell you that I took a class or that my mom sat down with me and taught me once a week… she just taught me by sewing all the time at home. Long story short… I’ve never taken a sewing class. 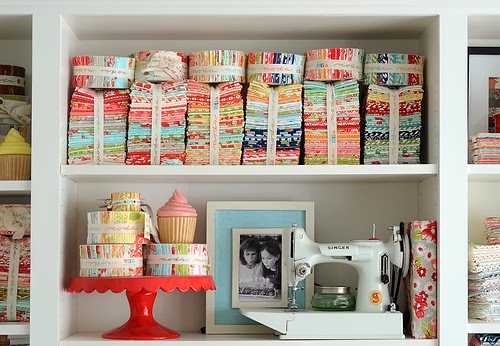 If I have a question about something sewing related, I will call my mom, look up the answer online, watch a YouTube video, or even look it up in one of my sewing books. I read a lot about sewing and own many books. I’ve also watched some great Craftsy videos on new techniques. So, last week I decided I wanted to take a sewing class. Yes, a real live sewing class. 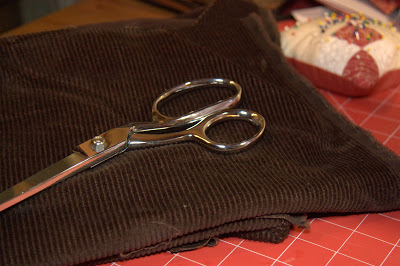 I found an inexpensive class at Pacific Fabrics in Everett and signed up! The class was on making pillow cases, using a “burrito method” and a French seam. I had no idea what a burrito method was and although I have done a French seam before, I couldn’t tell you how to do it again. I thought this would be the perfect class for me. And here’s my finished pillow case! I was a little disappointed because when I showed up for the class. I was really expecting a few people to chat with. Nope. I was the only person in the class. 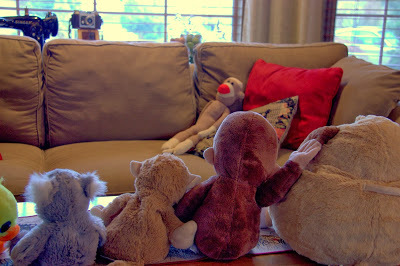 Although it was nice to have one on one instruction, I was kind of hoping to chat with a few new friends. The class was scheduled to last 2 hours. Since I knew what I was doing, when it came to seam allowances, cutting with a rotary cutter, and pressing, it took 45 minutes (including the time I needed to shop for the fabric). I’m kind of glad I took the class because this was one of those projects that I probably wouldn’t have followed if I had just read the directions. Did I really need to take the class? Well, no. I think a YouTube video would probably been good enough. So, when I got home, I decided to make a more complex version of the pillowcase. The complex version wasn’t too hard either, but I think it’s cute! While I’m on the topic of sewing, I thought I’d show you my steam iron. I bought it specifically for quilting and I love the crisp seams it helps create. It’s quite a large contraption, but I like the results. 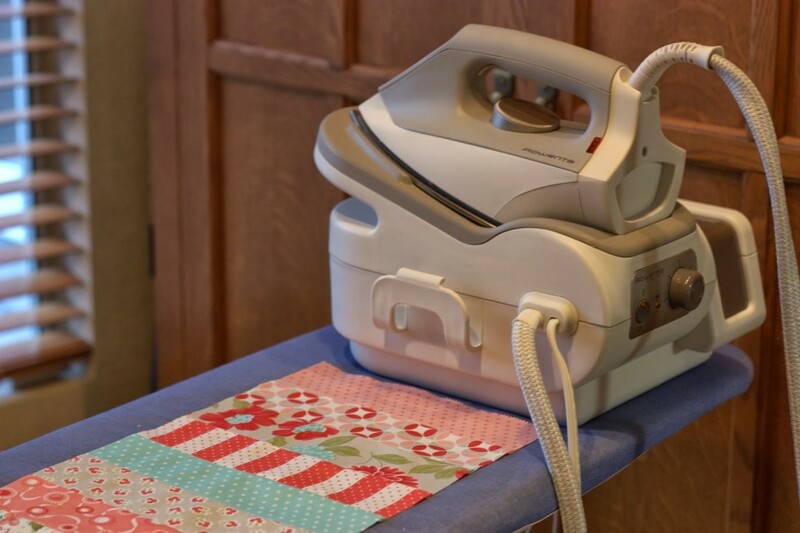 We still have a regular iron in the house, but I really love this one when I’m doing a lot of ironing at once or when I’m sewing. I have no idea how the different brands of steam irons compare. I did a little research online, picked one, and bought it. I’ve never tried another one, so I have nothing to compare to. I have a few more pillowcases to make, so I’m glad they were easy. Oooh, and it was a great “mail day” today too. An organic fabric company contacted me and asked me to review their fabric. 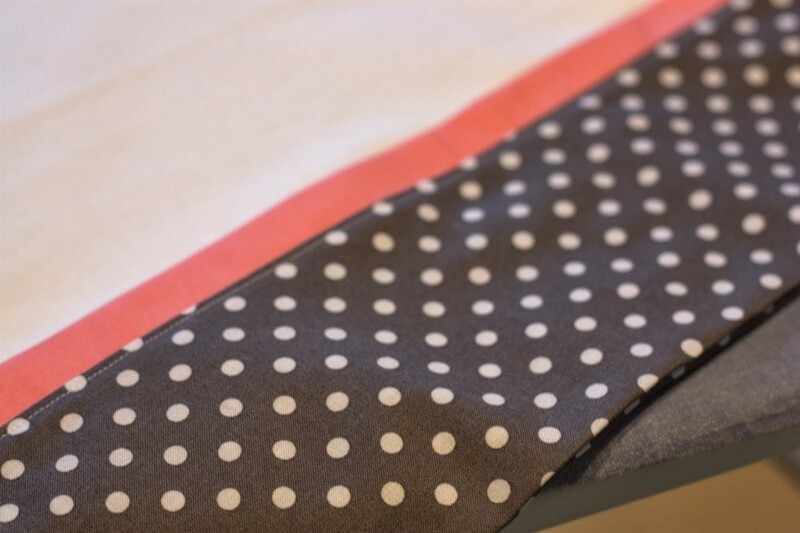 Three yards of a beautiful percale (perfect for pillowcases) arrived at my door today. I can’t wait to try it out! 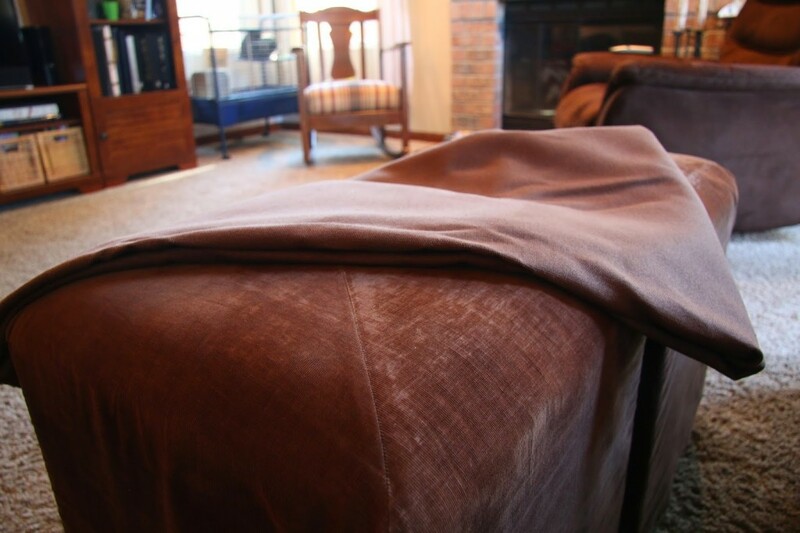 some brown corduroy fabric, a little extra time, and someone who loves to sew? 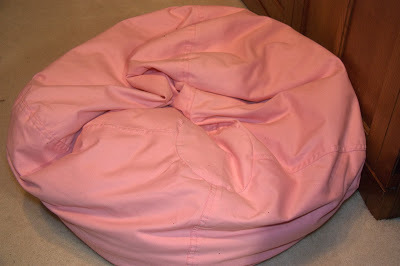 My daughter bought this old beanbag chair at Goodwill, several years ago. It was a perfect little dumping ground for all of her stuffed animals and laundry she didn’t want to put away reading area. Since we’ve redone her bedroom, and added a desk to the space, there really wasn’t room for the beanbag chair. I didn’t want to get rid of it because we use it when we have lots of kids over or need an extra seat when we’re watching a movie. Since it didn’t really have a home, it kind of moved from place to place. 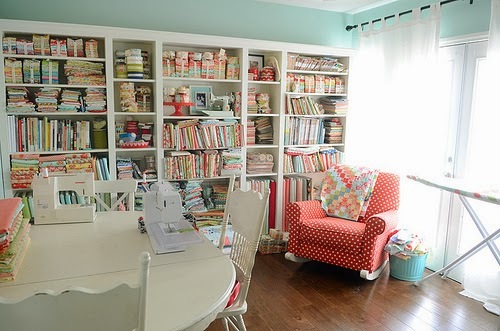 I’d find it in the family room, a corner of the hallway, or sitting on top of my craft table. I’d ask the kids to clean up and I’d never know where I would find it. 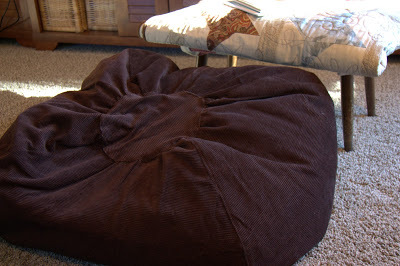 So how do you make a DIY Beanbag Chair? I started by trying to trace a pattern. 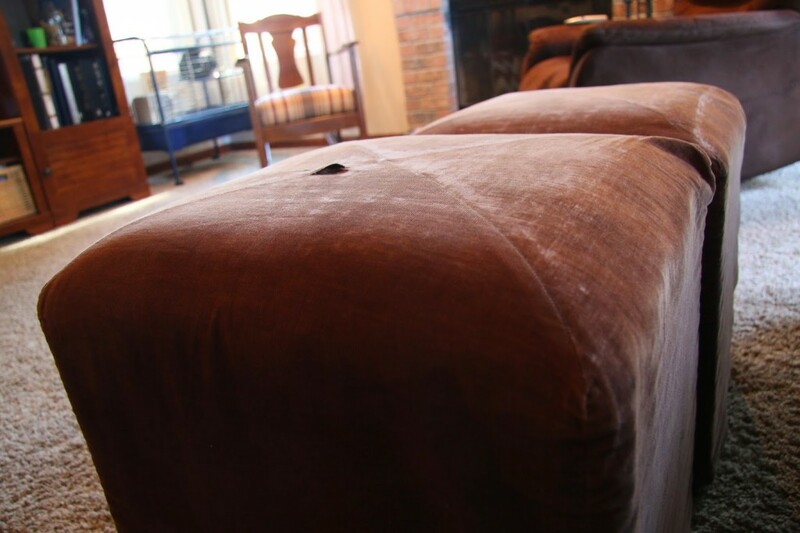 You can see the seams in a typical beanbag. 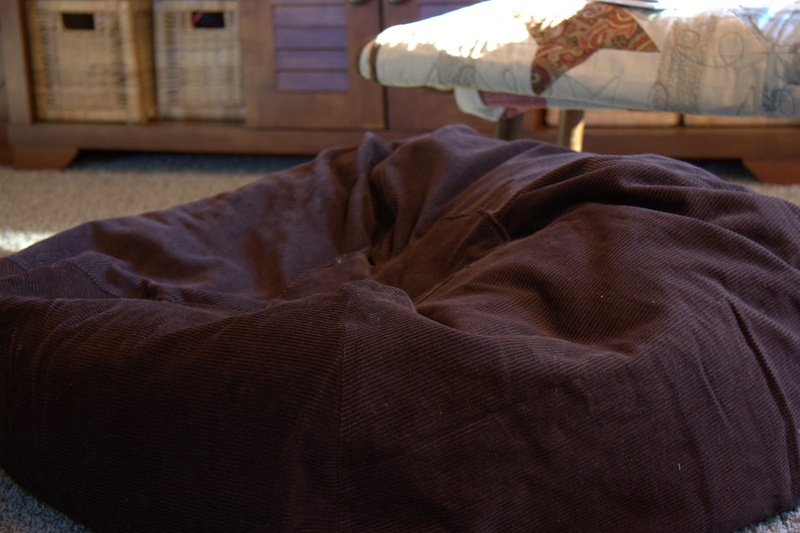 I tried to flatten out the beanbag the best I could, without taking any of the filling out. 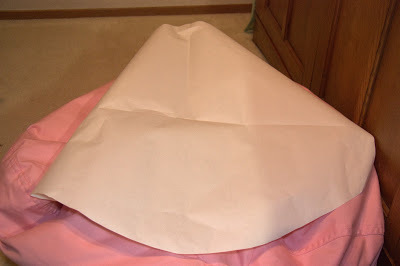 Then I just traced the seams and estimated how big I wanted to make it. It was kind of awkward, trying to trace a filled object, but I eyeballed it and it worked out ok. My pink beanbag had four panels, so that’s how many I knew I needed to make. I pinned my pattern to the corduroy and cut four of those pieces. My next step was the trickiest. I knew I would need to sew it into a tube-like shape, and I knew I couldn’t close the top or bottom all the way. I needed to leave room on the top and bottom to push and pull the old beanbag into place. I took two of my oval-ish shapes, placed them right sides together, and stitched along one side, leaving about 5 inches open on the top and 5 inches open on the bottom. Then I added pieces 3 and 4, in the same way. Once I had a flat panel of four pieces sewn together, I simply completed the tube by sewing piece 4 to piece 1 (right sides together). At that point I stuffed the old beanbag into the tube. 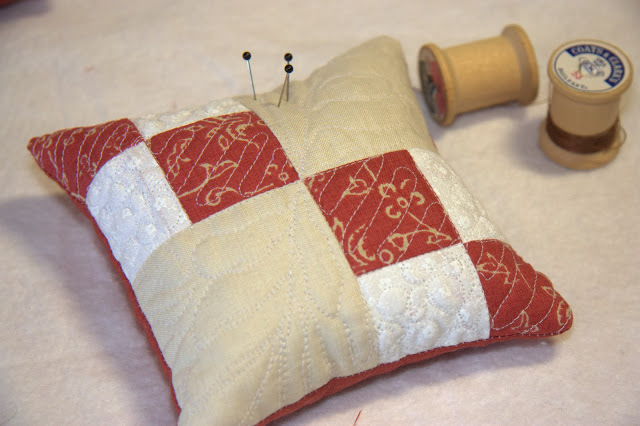 Then all that was left was to hand stitch a circle to the top and a circle to the bottom. This took the most time. I did most of it while I was watching a movie with my hubby and son. I tried to do an extra good job, knowing that kids+jumping+throwing+roughhousing=things falling apart. I think it turned out pretty decent. It’s nothing fancy, but it’ll do when we’re watching movies and need just one more place to sit. This was one of those projects that was SUPER easy to sew, but took a little thinking and planning to make it happen. Ideally, I would have put a zipper in one side, but I had no desire to drive to the fabric store, so laziness won. No zipper. Happy sewing (and movie watching)! My problem was solved when my daughter spotted this sock monkey kit at the fabric store, when we were picking out fat quarters for my mom’s quilted pillow. I think I shocked her with the answer to the question, “Mom, can I buy this?” She wasn’t expecting me to say, “Sure. Do you think you’d have fun making it?” It’s not often that I tell my kids they can buy something for themselves, just days before a holiday like Christmas. She could hardly wait to get home! Right away, we set up Santa’s Workshop. I needed my sewing table for my mom’s present, so we set up the folding table in the living room for my little buddy to use. Hindsight, I probably should have set her up somewhere less obvious. We had many, many, friends stop by with goodies and the first thing they saw was the sewing station. After a couple of hours, Sock Monkey was born. I offered a few more creative name suggestions, but I couldn’t convince my youngest that there was a more suitable name than Sock Monkey. I’ve said this before, but I’m incredibly impressed that my 9 year old knows how to set up her sewing machine, thread the whole thing and start sewing with a fairly consistent 1/4 inch seam. She did absolutely all of the cutting and machine sewing on her own. She turned the pieces and stuffed the monkey too. The only part she needed help with was the hand sewing. That’s her least favorite part of any sewing project. I can’t say I blame her. 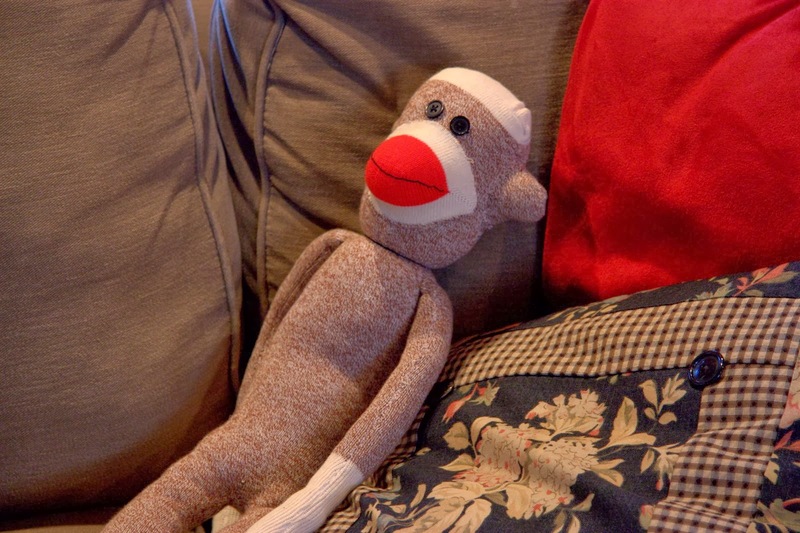 Sock Monkey has been our favorite toy over the past few days. He’s been dancing with his BFF, spending time watching her play Barbies, and he commands an audience like no other monkey you’ve ever seen. School is in session, in the photo below. 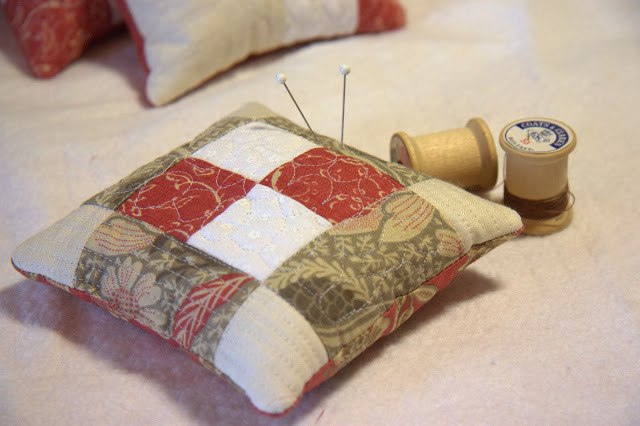 Are you one of those people who really wishes they could sew, but just don’t give it a try? It really didn’t take long for my daughter to become confident with a sewing machine. Give it a try, Friends! Maybe you’ll end up making a new best friend too! About 2 days before Christmas, I had finished everything I needed to do and decided I needed another project. I opted for something small for my mom. My daughter and I headed to the fabric store and picked out a few fat quarters to sew into a fun little project. My mom’s living room is green and burgundy and those are two colors I don’t really have in my stash. I got my inspiration from Pinterest. 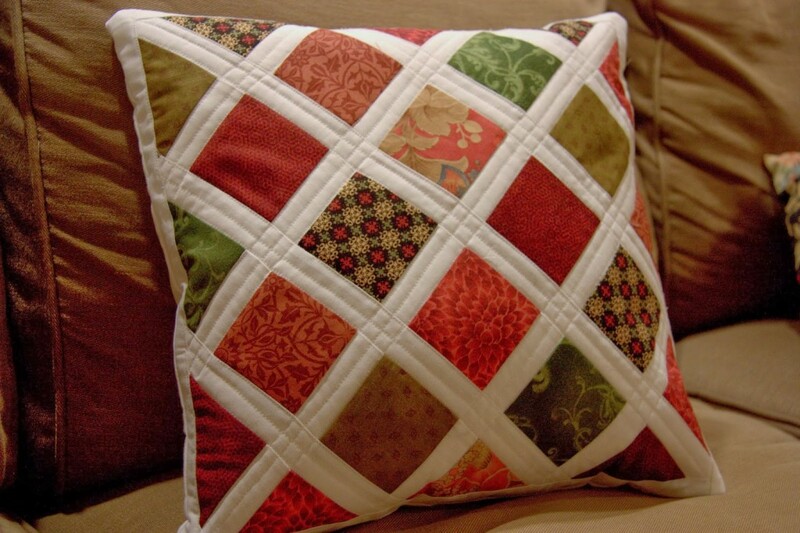 I searched quilted pillows and found a look I liked. Then, I used my quilt making program to design my own version. About an hour later, my quilt top was done and I was ready to quilt it. 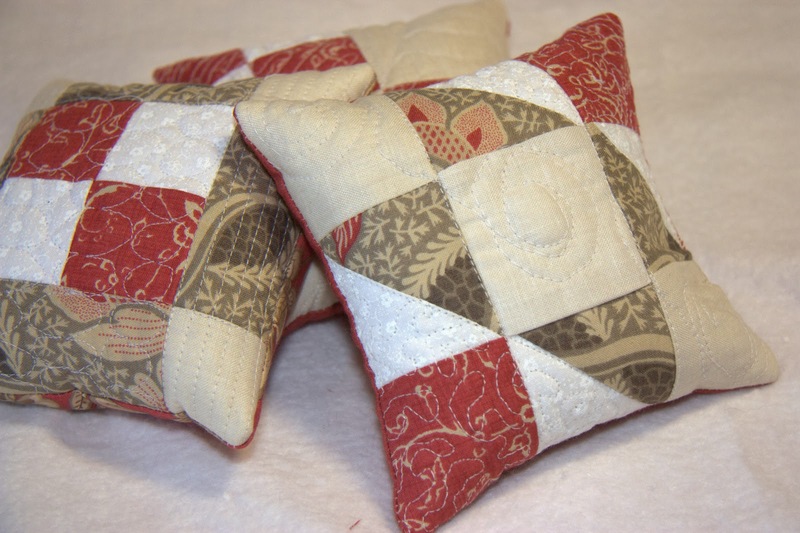 I love making pillows because they are like quick and easy mini quilts. Not too bad for a last minute, one hour project! Merry Christmas to my Mommy! I’m kind of in love with these little pin cushions. 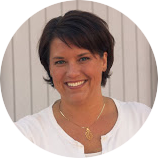 I signed up for the Craftsy class with Camille Roskelley. In the class, she made a cute little pin cushion. I loved the one she made, but I really wanted to design my own. 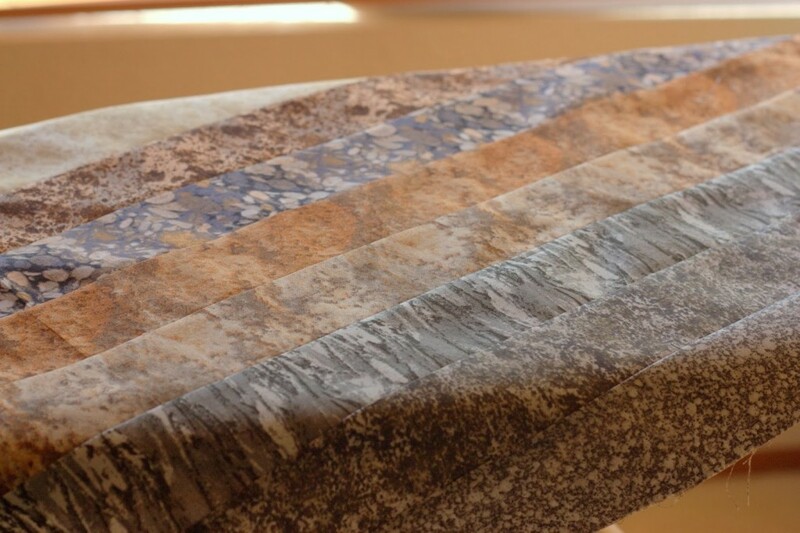 I designed three different blocks, quilted the tops, and filled them with crushed walnut shells. Everyone has crushed walnut shells sitting around their house, right? No, actually, Camille told me me that little trick. They sell crushed walnut shells in pet supply stores. It’s used in bird cages. Hmmm. Suddenly, the letters O, C, and D just popped into my head. In my last post, I shared that my BFF, Camille, (ok, in reality she has no idea who I am) has inspired me to try my hand at quilting again. 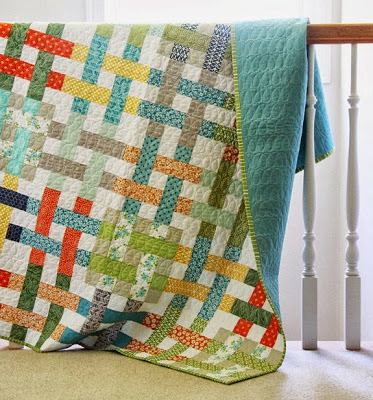 You see, I love the piecing and designing aspects of quilting, but I’ve never been a fan of quilting. 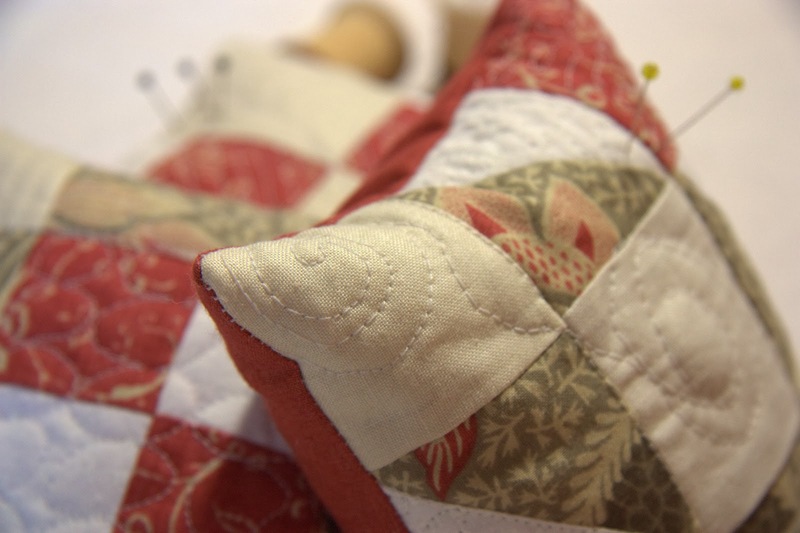 As a matter of fact, I usually always send my quilts out to be quilted by a professional. I claim that it’s because I just can’t stand squishing a big quilt through a tiny machine, but my lack of artistic ability may play a tiny roll in this. I can’t draw to save my life, and quilting is very much like drawing or doodling. With Camille Roskelley as my inspiration (she said something in one of her books about how much she loves the process of quilting) I tried several different quilting techniques on these little pin cushions. 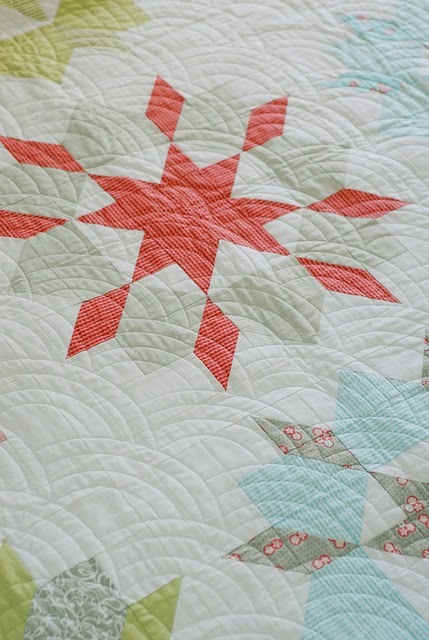 We won’t show any close ups of the quilting, but I’ll say I had fun giving it a shot! I’m off to organize my pins!